But not for me and my brother. We hated those trips. If New Vrindaban was a source of comfort for our parents, it was a source of shame for us. We thought the Hare Krishnas were freaks, fake Indians aping Indian ways. Not that we wanted anything to do with real Indians, either. We wanted to be home watching TV. We would only grudgingly pile into the car for the drive, then sulk as we snaked our way up the Ohio River, through the small towns of rural Appalachia, and into the panhandle. At the commune, we saw white women wearing the very saris I begged my mother not to wear to my school functions. We saw Americans chanting ecstatically in the same Sanskrit I deliberately garbled and mumbled under my breath during my family’s weekly pujas at home. When my parents tried to send my brother and me to summer camp there, we refused. When they considered renting a cabin by the commune’s lake, we protested. Our classmates spent summers inner tubing on the river. Why couldn’t we do that? Why couldn’t we be more like them? My parents must have been both proud and confused to see these white Americans modeling themselves after Indians — dressing in traditional Indian clothing, adopting Indian customs and religious practices — even as their own children were flatly rejecting Indian culture and desperately trying to assimilate. This was long before we knew anything about Swami Bhaktipada’s legal troubles. By 1990, when he was indicted on federal racketeering charges stemming from the murders of two devotees, my family had stopped going to New Vrindaban. The South Asian population in our small town had grown, so perhaps my parents felt less of a need to find community elsewhere. New Vrindaban was no longer new and exciting. The sheen had worn off. The place was falling into disrepair. But a few months ago, my parents went to New Vrindaban again for the first time in many years. They went because my cousin was visiting from India and she wanted to see it. She is a Hare Krishna devotee. That my cousin, who has lived her whole life in India, belongs to a Hindu movement that started in America is amazing to me. That the Hare Krishna temple in West Virginia was on her list of sacred sites is even more so. My mom said that the commune was now approaching its former glory. The gardens are once again tended, verdant. There were no elephants, but she said she saw a peacock. As for me, I no longer feel a distinction between being Indian and being American. I travel to India frequently with my partner, Robert. 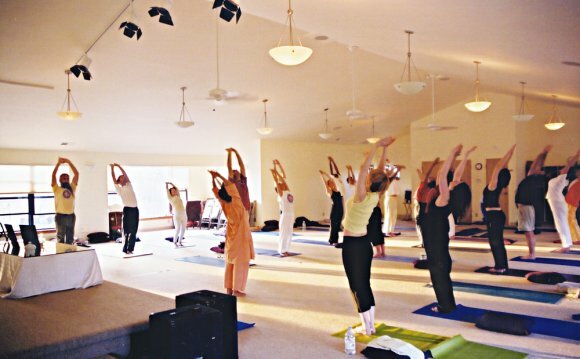 We like to visit yoga ashrams in the Himalayas and, while there, follow a rigid schedule of meditation and spiritual instruction perhaps not so different from what the Hare Krishnas in New Vrindaban might follow. Of all the activities, I find myself particularly drawn to chanting. In fact, “Hare Krishna, Hare Ram” has become one of my favorites. It makes me smile now to remember how miserable my brother and I were at New Vrindaban. We might not have even gotten out of the car were it not for one thing: the gold leaf that covered the palace. We’d heard it was real gold. So we would walk around staring at the marble floors, hoping we’d glimpse a glimmer, a flake forgotten somewhere in a corner, something precious we could secret into our pockets and take back home. We weren’t so different from our parents, then, after all. What the temple gave them wasn’t much, a day trip, now and then. But at a time when there was so much about America to make them feel lonely and insignificant, New Vrindaban made them feel rich.